It’s been a while. There are a variety of reasons mostly related to health, so I won’t bore you. Spring will be here in 19 days! It seems that on the one hand, winter has flown by; but on the other hand, it feels like she has been around forever. We haven’t had it hard at all this year in terms of really cold weather and there have been only a few weeks out of the many where temperatures have crept down to 40 below. An abundance of warm weather (by Interior Alaskan standards) has brought snow, snow and snow. It’s been several years since we’ve had this much of the white stuff and according to the weather forecast, we aren’t finished yet. We are expecting another series of storms early next week that will dump more snow. It is becoming challenging to find room to push snow out of the driveway and the city of Fairbanks has pretty much filled the areas they normally deposit the snow plowed off the roads. 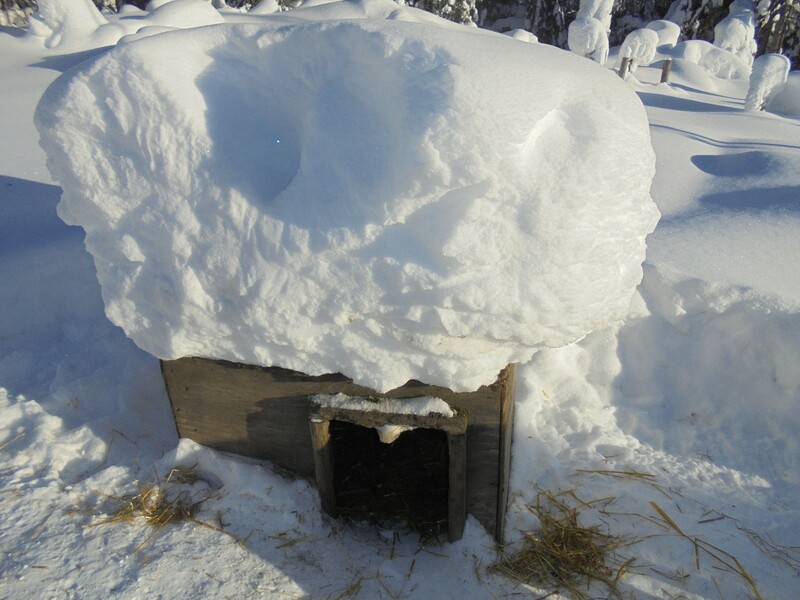 Here’s a photo of one of the dog houses. Now snow was shoveled off it in December, just before we had our annual crappy “winter” weather that features rain and ice, instead of snow. We like the snow to bank up around the houses and on the roofs to provide extra insulation in addition to all the straw bedding. This weekend we’ll shovel the roofs again because now that it’s warmer, the dogs like to lounge on top of their houses. The sun has returned in her full glory and the gloomy, half-light days are well behind us. We are even noticing that the rays are warm again and south facing windows have curtains pulled way back to help heat the house. 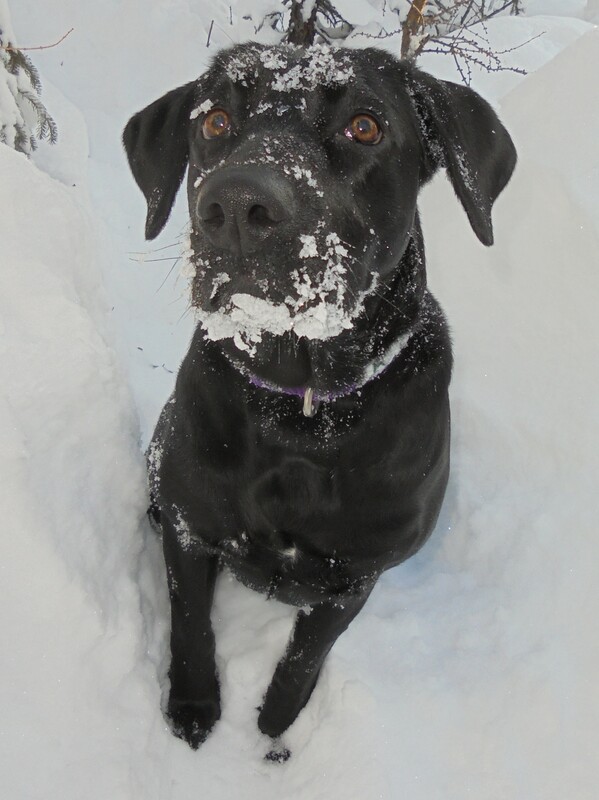 Bella, the Labra-dork, and I try to go for a walk in the woods every day to check snares, take photos and look at animal tracks. Well, I do all of that. 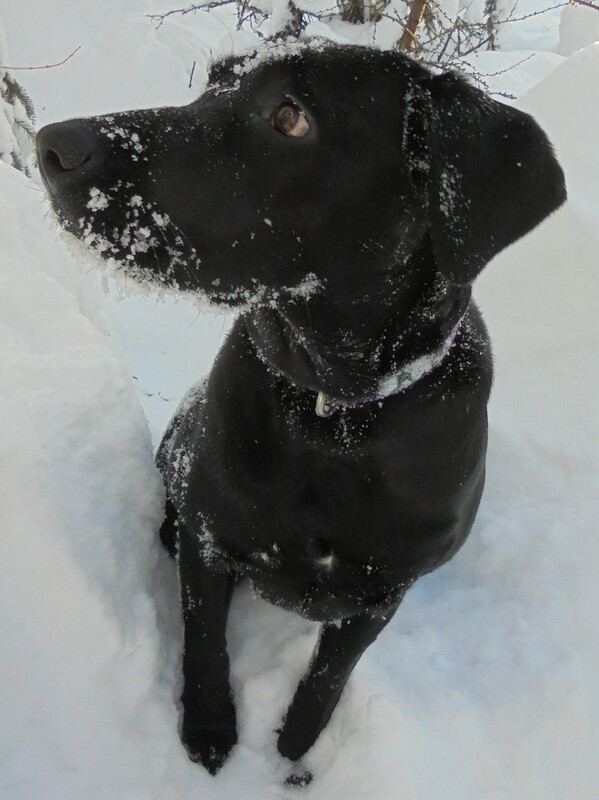 She runs around, nose to the ground, or dives into the deep, soft snow in a mostly vain hunt for the voles and squirrels she can hear underneath the drifts. If you’ve ever seen a fox leap into the air and then go head first into the snow, then you have some idea of what my weird dog gets up too. Is this my best side? Actually she was watching ravens and ignoring me. The look of an unsuccessful vole hunt. As the weather warms I see a lot more evidence of the animals moving. We see the tracks of voles, squirrels, snowshoe hares, owls, ravens, moose, fox, marten and lynx. It may seem quiet out there, but the woods are teeming with creatures living their lives. With the deep snow, the moose are frequently seen on trails and they are also pretty cranky right now. Food is harder to find and cows are heavy with unborn calves. A couple of weeks ago I was walking down to the dog yard in the dark to feed the sled dogs, when a cow moose and a yearling calf exploded out of the willows, not more than 15 feet to my right. I was so thankful she chose the trail to our neighbor’s yard and not the one I was standing on! I backtracked to the house, grabbed the shotgun (just in case) and walked down to the dog yard, talking away and pulling the food sled with one hand and holding the shotgun with the other. It was unnerving to shine my headlamp in her direction and see her just standing there, head lowered and staring at me. Moose are very dangerous, but especially so at this time of the year. I fed dogs and when I walked back up to the house, she was in the exact same spot, standing and staring. Until the snow melts, I need to pay better attention to the world around me! Nice to hear from you Peg. Thanks Peter. It’s nice to be back! Hi Peg, nice to see Alaska hasn’t swallowed you up. This winter has been quite strange here in south west Ohio too. One week the temp’s are 20’s & 30’s for the high’s and the next week 60’s & 70’s. I think we almost got up to 80°, (78°, 79°). Hi BJC. Nope, I am still alive! LOL. After all the snow we’ve had, I’m hoping our spring rains will be reasonable or it’s going to be very muddy! Nice to hear some insider info! Keep the dream alive and Enjoy! Hi Jamie. I really appreciate your kind words and you taking the time to read my blog!